Physicists from around the world met at CERN to strengthen their data-deciphering skills at the second LHC Olympics workshop. 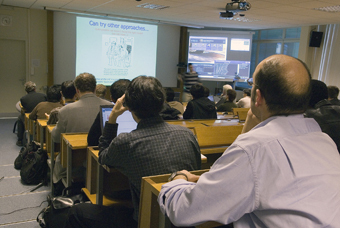 Physicists gather for the second LHC Olympics workshop. Coinciding with the kick-off of the winter Olympics in Turin, more than 70 physicists gathered at CERN from across the globe for the second LHC Olympics workshop on 9-10 February. Their challenge, however, involved brains rather than brawn. As the switch-on date for the LHC draws near, scientists excited by the project want to test and improve their ability to decipher the unprecedented amount of data that the world's biggest and most powerful particle accelerator is expected to generate. The LHC Olympics is a coordinated effort to do just that, minus the gold, silver and bronze of the athletics competition. 'In some ways, the LHC is not a precision instrument. It gives you the information that something is there but it's hard to untangle and interpret what it is,' said University of Michigan physicist Gordy Kane, who organized the Olympics along with Nima Arkani-Hamed from Harvard University, Herman Verlinde from Princeton University, Matt Strassler from the University of Washington, Steve Mrenna from Fermilab and Ignatios Antoniadis and Gian Giudice from CERN. The challenge for theorists is to solve what Kane calls the 'LHC inverse problem,' which requires scientists to figure out the physics origin of LHC data instead of focusing on what the accelerator itself can do. To help physicists master this difficult technique, teams of theorists from the Universities of Michigan, Harvard and Washington set up three mock. LHC data sets generated with programmes from theoretical models. The data sets, known as black boxes, were posted online along with instructions on how to use collider event simulation tools and a place to post comments, results or questions about the challenge. The scientists were then encouraged to interpret the data, looking for signals of new physics such as the Higgs boson and supersymmetry and to try to determine the spectrum of new particles that gave the signals. The recent workshop included tutorials on available simulation tools, lectures on deciphering data, discussions between theorists and experimenters and a chance for participants to report on their progress. At the end of the session, answers to the boxes were revealed. The opportunity for more practice is just around the corner. Unlike the athletes in Turin, the physicists won't have to wait another four years to prove themselves. They'll be competing again at the summer LHC Olympics workshop in August.